Physician burnout is a serious problem, for both providers and for patients. 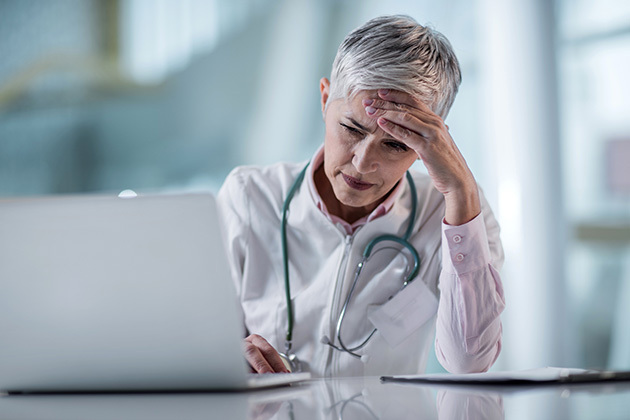 In fact, 83 percent of respondents to an April 2018 survey said that burnout was a moderate or serious problem for many clinicians and clinical leaders in their organization. Burnout among physicians has already reached epidemic proportions, and the percentage of physicians experiencing symptoms of burnout is growing, according to a new paper written by University of California, Riverside School of Medicine doctors. This paper shows that physician burnout jumped from 45.5 percent to 54.4 in just three years. "Doctors aren't depressed or less content at home," write the co-authors of the paper. "They’re less happy at work." Dr. Andrew G. Alexander, an associate clinical professor of family medicine, and assistant clinical professor of family medicine Dr. Kenneth A. Ballou wrote the paper. The authors published their work in the August 2018 issue of the American Journal of Medicine. The morphing of the doctor-patient relationship into an insurance company-client relationship, one that limits the treatments doctors can provide to members of the insurance company. Cynicism from patients who no longer expect continuity of care and routinely change doctors. Lack of enthusiasm for work. The researchers compared data collected from 2011 to 2014 on satisfaction with work-life balance and physician burnout. For the purposes of this study, the authors characterized physician burnout as a feeling of a lack of accomplishment, feelings of cynicism, and the loss of enthusiasm for work. The researchers defined work-life balance as focusing on satisfaction with work and the potential to have a happy life while away from work. They used the Maslach Burnout Inventory to measure feelings of personal accomplishment, emotional exhaustion, and depersonalization among physicians. The results showed that burnout was highest in physicians working in emergency medicine, family medicine, internal medicine, and pediatrics. Physician suicide and depression rates remained stable during the study period, but the perception of a healthy work-life balance dropped from 48.5 to 40.9 percent. Alexander writes, "Doctors now spend more time with electronic health records than they do with patients. Electronic health records were pushed by the government at great expense and without regard to the effects upon patient or physician health. Go into any hospital and look for the nurses and the doctors. You will find them sitting in front of computers. They are not happy, and their patients are not healthier." Alexander goes on to say the effects of integrating EHRs were not what the medical community expected. "At first, they were accepted because of the promises of chartless offices, initial government subsidies, interconnectivity between health care sites, availability of records from home, faster charting, e-prescribing direct to the pharmacy, and higher physician pay for computer-cloning the federal government's bullet-point reimbursement formula," said Alexander. "When the subsidies ran out and the promises turned into extra cost, less time with patients, time at home finishing EHR records, unreadable and meaningless cloned patient notes, HIPAA-restricted access to outside records, and government penalties for not 'mining' patient data that cost money to input, doctors became overworked robots."